Youngsters under 60 will have a struggle in understanding the following. Senior citizens, however, will smile in pleasant memories. This step back to yesterday is courtesy of Caroline Letterman Irvin, a University of Texas classmate way back in the 1940s. 1. You had to hang the socks by the toes. NOT the top. 2. You hung pants by the BOTTOM/cuffs... NOT the waistbands. 3. 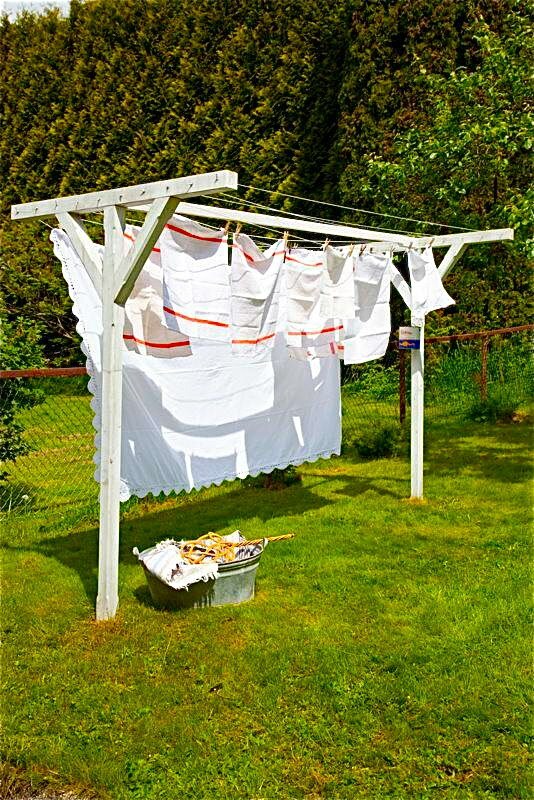 You had to WASH the clothesline(s) before hanging any clothes. Walk the entire length of each line with a damp cloth around the lines. 4. You had to hang the clothes in a certain order, and always hang "whites" with "whites," and hang them first. 5. You NEVER hung a shirt by the shoulders - always by the tail! What would the neighbors think? 6. Wash day on a Monday! NEVER hang clothes on the weekend, Or on Sunday, for Heaven's sake! 8. It didn't matter if it was sub-zero weather... clothes would "freeze-dry." 9. ALWAYS gather the clothes pins when taking down dry clothes! Pins left on the lines were "tacky"! 10. If you were efficient, you would line the clothes up so that each item did not need two clothes pins, but shared one of the clothes pins with the next washed item. 11. Clothes off of the line before dinner time, neatly folded in the clothes basket, and ready to be ironed. IRONED??!! Well, that's a whole OTHER subject! 12. Long wooden pole (clothesline pole) that was used to push the clotheslines up so that longer items (sheets/pants/etc.) didn't brush the ground and get dirty. It also said, "On vacation now"
when full lines sagged with not an inch to spare! as neighbors carefully raised their brows and looked the other way. Some youngsters who have read this far may be thinking, how could those old folks be so stupid? Didn’t they realize they were inviting thieves into their back yard? Although it is hard to imagine today, this was a different era. If you lived in a small town, you did not even bother to lock your doors at night or when slipping off for a visit. Why bother? The door locks were operated with “skeleton” keys that were available for a dime a dozen at the local hardware store. And, yes, there are clothes lines in my back yard today. My wife has a clothes pin apron—a short apron just for those pins. Those lines are the preferred dryer for bed linens. Sheet dried by the sun and wind are wrinkle free instead of the crumpled mess coming out of an electric or gas dryer. They also smell much cleaner and fresher. What a shame that youngsters will never know the joy of slipping into bed between smooth, sweet smelling sheets. Yesterday was not all bad.